We provide Rental Recreational Vehicles that are perfect for camping, exploring Texas’ national parks and scenic byways, tailgating, weekend excursions – and so much more! For every hobby or passion, there is a DFW Camper to help you enjoy it more. 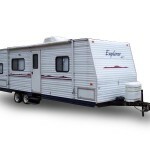 DFW Camper Rentals understands that there are a lot of questions when you rent a Camper in Ft. Worth, Texas. We have many years experience owning, operating, maintaining, and renting RV’s, trailers, and campers and we look forward to helping you and your family enjoy the great outdoors on a family camping vacation. Don’t waste the opportunity to bond with your family and share a lifetime of experience in our Camper Rentals. Many of our customers have never rented a camper before and absolutley love how exciting and easy it is. Whether you are traveling to one of Texas’ beautiful lakes, a national park, or a car race make sure you have a worry free trip. Don’t risk a break down with a used and poorly taken care of travel trailer. Come to DFW Camper Rentals and you will not be disappointed!